The Holidays are long over. They are long enough over that I’ve done some reflection. It got me thinking, that as dear as family is, sometimes friends feel like family. If I’m really honest here, there are a few family that feel like friends. When I was in college, I got to know a girl named Kari in the most unique way – I was dating the guy that she previously dated. It turns out that she wanted to know who his “new” girl was and thus commenced sushi dates. Soon our conversation shifted from the shared experience of dating the same guy to deeper topics. She began having a great influence in my life and continued to do that over our years in college. Ironically, many years later I started dating her brother, Greg, and later married him. As excited as we were to go from being dear friends to family, we never expected the challenges that we would experience in this transition. Challenges Can Bring a Friendship Closer! This is what I’ve learned—that no relationship will be challenge-free. I began contemplating this over the Holidays because Kari came to stay at my house with her 3 children. (My nieces and nephew!) I began to think how grateful I was that we continued to “fight” for our friendship over the years. We never gave up on each other. As we walked through conflict, challenges, and differences of opinions—it led us to a very deep level of connection. When conflict is handled in a healthy manner, it can bring two friends even closer. Kari and I have also experiences many tender moments while raising kids, had many belly laughs, and shared our deepest joys and concerns with each other. But, these moments wouldn’t be as sweet had we not been through the challenges in the beginning of our relationship. As I reflect not only on this friendship, I am convinced it’s too easy to discard friendships unnecessarily. I wrote a book, Grown-Up Girlfriends. In it, I talk about different levels of intimacy in friendship and how in different seasons of life—our friendships may shift to different levels of closeness. 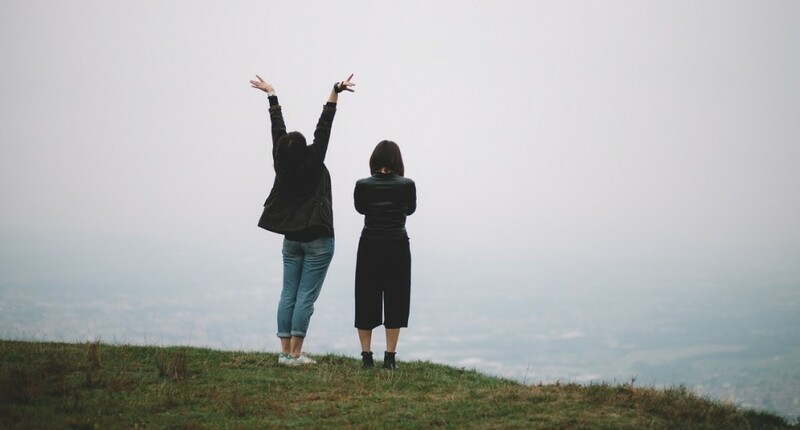 It seems like, though, many women walk away from friendships when it gets difficult or challenging—maybe even ceasing any communication and harboring bitterness. I want to encourage you to see these challenges differently. Sometimes in the most extreme situations, we may need to severe a friendship due to a harmful situation. When it comes to the day-in-and-day-out disagreements, maybe a little shift in the intimacy for that season (albeit long or short) could allow us to have a change in heart, or allow for a conversation to occur with that friend (and only that friend—no gossip ladies). Ultimately, it may allow for this friendship to heal, even if at a different level of closeness or intimacy. So, ladies, I want to challenge you to fight for your friendships. That you would fight to keep them, and not flippantly walk away from them. It’s an amazing thing to look back over the years and know that I have a dear friend and family member that has walked through many seasons of life with me. It’s unreal to me that Kari knew me back in college and that we have shared getting married, having children, losing a child, losing a mother, selling homes and moving, starting new jobs, and—both of us adopting children in our 40’s (making us the oldest mothers in our daughter’s kindergarten classes)! I can promise you—I wouldn’t trade these experiences for the world—even the challenging ones. As you reflect on your friendships, think of the ones that are challenging right now or have been challenging in the past. As the desire rises up to walk away, give up and severe any ties—think of Kari and me. You never know what possibilities might unfold. Who is your longest friendship? What is one of the more embarrassing things they know about you?